Last week was S’s sister’s 24th birthday. 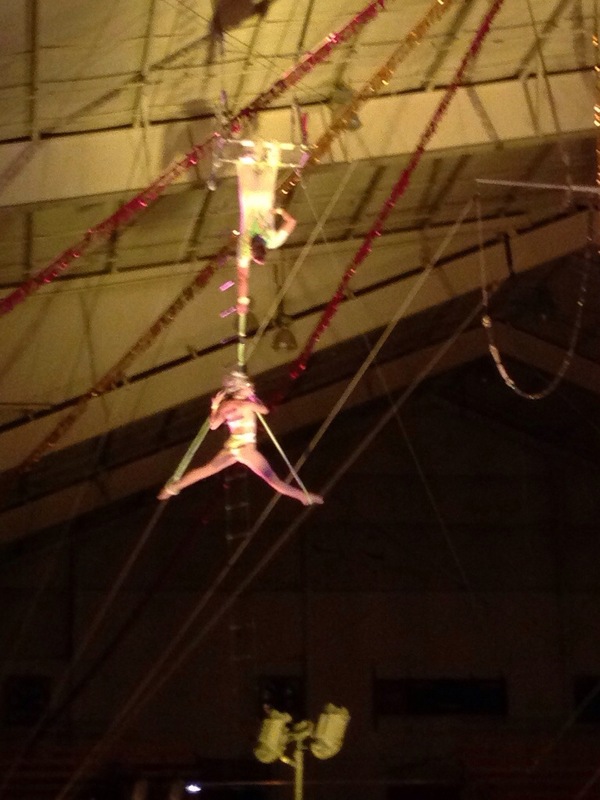 To celebrate, she decided to invite everyone to attend the circus with her. 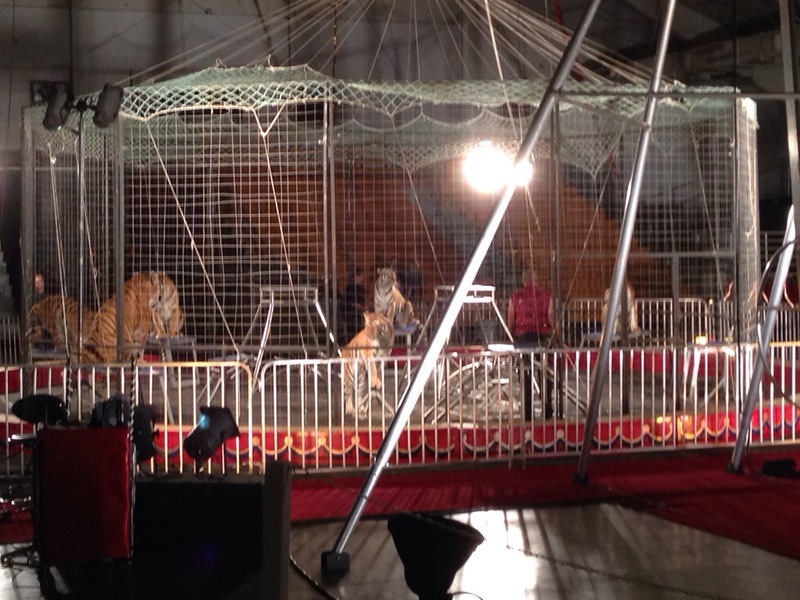 I can’t remember the last time I went to the circus. I was really hoping to see all the traditional circus-y things. When the show finally started, they opened with tigers. I must admit, I did not particularly enjoy this segment. The tigers looked very unhappy, and were not pleased to have a rope swung at them (can you blame them?). I kept imagining what would happen if one of the tigers went rogue and decided to eat the trainer. They were lovely animals. Huge cats that radiate with power. 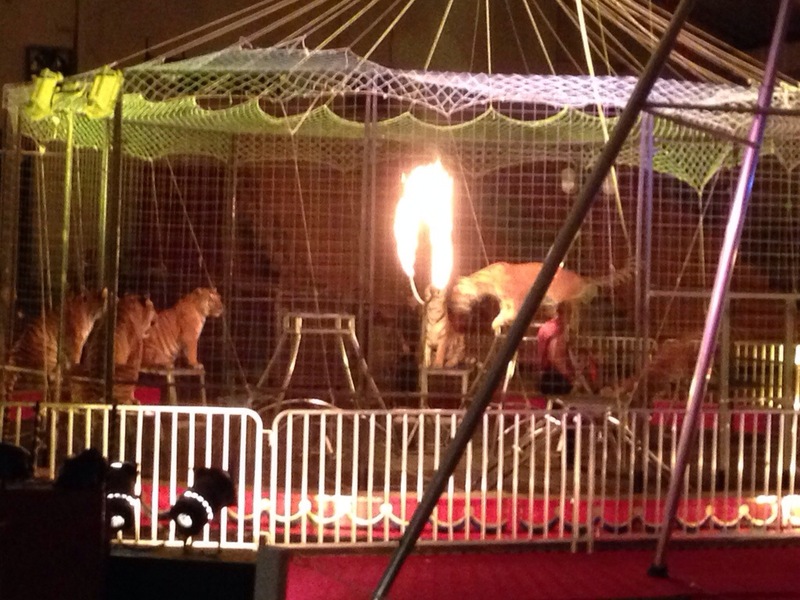 As a finale to the tiger show, he had them jump through a ring of fire. 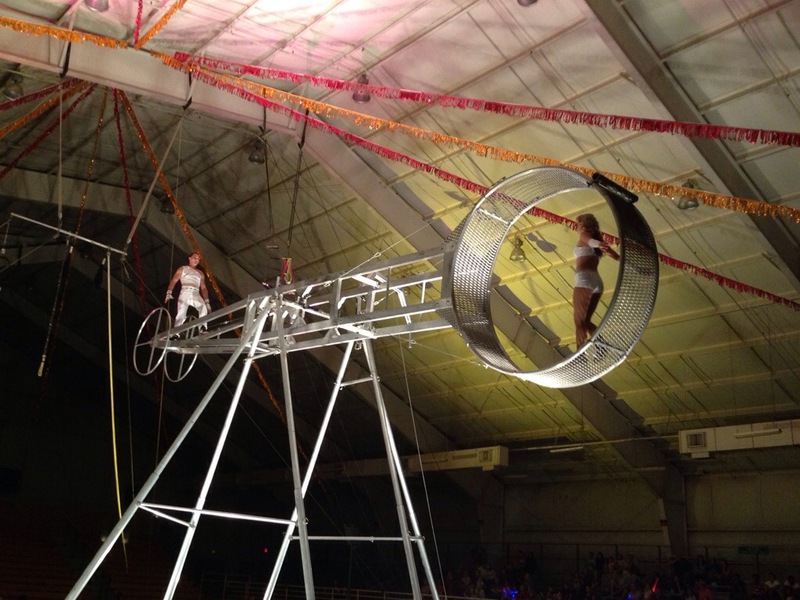 There was also a series of dog acts, juggling, another trapeze act, and some fantastic tumblers. The tumbling acts were probably my favorite. I was so excited, I forgot to take pictures. 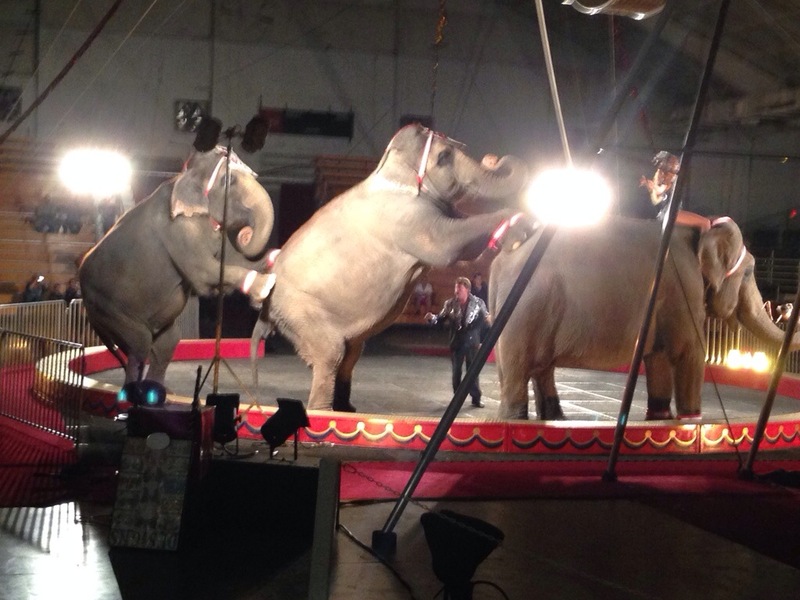 Elephants appeared on stage toward the end of the night. Right on cue, they even pooped as they exited. 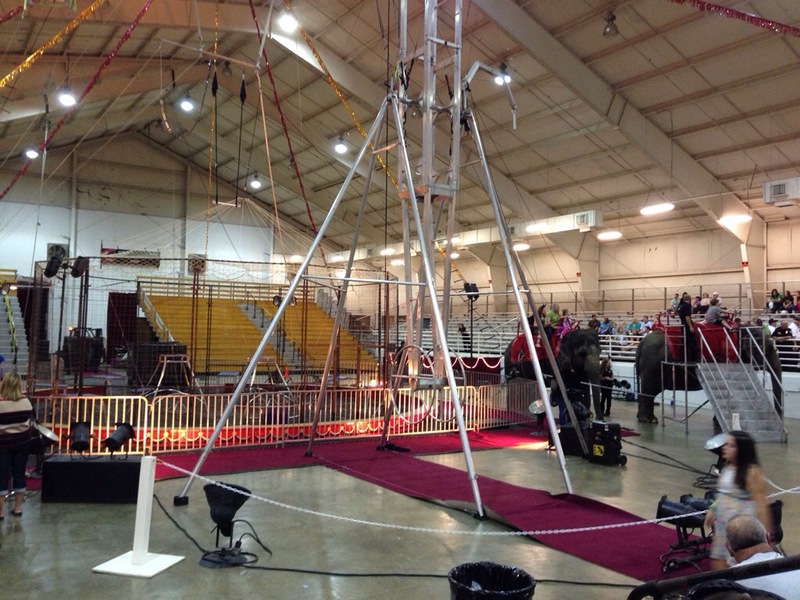 In the picture, they have it balanced in the air, but the contraption went around and around. At first, the girl was in the cage part just walking. Then she got out and the guy got in. It was the most stressful part of the show. The man almost died and my heart was beating and oh. He walked on the inside, like the girl, but then he walked on the outside of the cage, as it was all turning. This was all fine and good, but then he added a jump rope. He tripped, but caught himself and everything was okay. For his grand finale, he blindfolded himself and walked the outside as it was turning. He tripped again and stumbled forward and barely caught himself and my blood pressure sky-rocketed. I was sure he was going to fall. 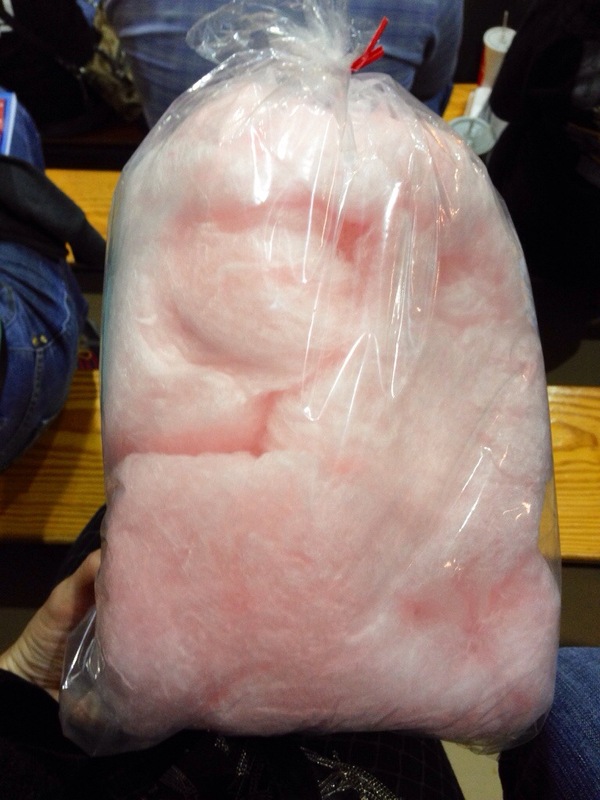 In other news, I got a giant bag of cotton candy, which is arguably the best part of the entire experience.